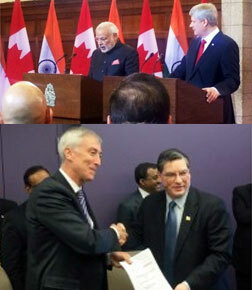 Canada, April 2015 – At the Parliament of Canada in Ottawa in the esteemed presence of Prime Ministers Modi & Harper, the President of Seneca College, Canada signed an MOU with the CEO of National Skills Development Corp (NSDC) to provide skills training in the Health Sector in India. The MOU resounds Hon’ble Prime Minister Modi’s vision to skill more than 200 Million youths who would be joining the workforce in the next 15 years, to make India the global resource for Human Capital for the rest of the world – where the workforce is expected to shrink because of the ageing population. INSCOL, the Indian Partner for this initiative have the mission to train 50,000 trainers and over a million allied healthcare professional in the next 10 years. In partnership with Senecal College and National Skills Development Corp (NSDC), INSCOL would be setting up academies of excellence throughout India. This will not only include Nurses, but other allied Healthcare professionals such as Para medics, technicians, nurse assistants, pharmacist assistants, dental assistants, etc. This venture opens up a huge opportunity for INSCOL to not only strengthen its leadership position in the health sector skills training but to also foray into training non-nursing allied healthcare professionals. It opens up avenues to work with central & state; government and non-government institutions such as NSDC, NABH, TNAI, Directorates of Health Services, Nursing Registration Councils, Universities & Colleges, Government & Private Hospitals, etc. INSCOL has been in Healthcare Services & Education since more than 20 years and is now the leading provider of Post-Registration Nursing Training & Education in India. INSCOL has partnerships with leading education providers in Canada, UK, USA, Australia & New Zealand and is also the leading training centre for American Heart Association. INSCOL has established state-of-the-art simulation labs so that nurses can practice under unique clinical scenarios which sometimes are difficult to access in a hospital environment.